Therefore, the best rule of thumb for selecting an air motor is to choose one that will provide the horsepower and torque needed using only two-thirds (2/3) of the line pressure available. The full airline pressure will then be available for overloads and starting. An air motor slows down when load increases… at the same time, its torque increases to a point where it matches the load. It will continue to provide increased torque all the way to the stalled condition, and it can maintain the stalled condition without any harm to the motor. 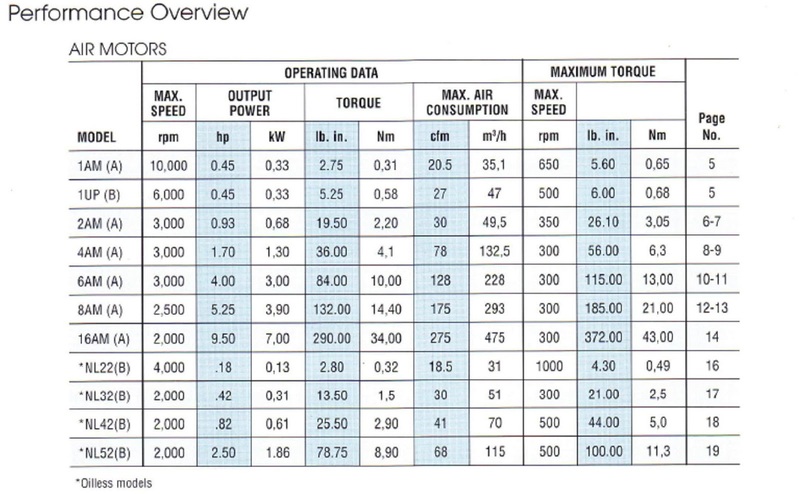 As the load is reduced, an air motor will increase speed and the torque will decrease to match the reduced load. When the load on an air motor is either increased or decreased, speed can be controlled by increasing or decreasing air pressure. Air consumption increases as speed and air pressure is increased.